The following are portions of remarks from Asa Thurston (printed in the Polynesian) on the changes which have taken place in the Islands, looking back over 28-years from 1820, to 1848 0 the first 28-years of the Hawaiian Mission. In the dawn hours of January 18, 1778, on his third expedition, British explorer Captain James Cook on the HMS Resolution and Captain Charles Clerke of the HMS Discovery first sighted what Cook named the Sandwich Islands (that were later named the Hawaiian Islands.) Hawaiian lives changed with sudden and lasting impact, when western contact changed the course of history for Hawai‘i. Forty years after Cook’s death, the Pioneer Company of American Protestant missionaries (American Board of Commissioners for Foreign Missions (ABCFM)) set sail on the Thaddeus for the Sandwich Islands (on October 23, 1819.) There were seven American couples sent by the ABCFM to convert the Hawaiians to Christianity in this first company. Missionaries arrived first at Kailua-Kona on April 4, 1820; they then went to Honolulu and arrived there on April 14, 1820. By the time the missionaries arrived, Kamehameha I had died and the centuries-old kapu system had been abolished; through the actions of King Kamehameha II (Liholiho,) with encouragement by former Queens Kaʻahumanu and Keōpūolani (Liholiho’s mother,) the Hawaiian people had already dismantled their heiau and had rejected their religious beliefs. So, what was Honolulu like forty-years after the first arrival of foreigners? The following, from books, journals and letters, helps to paint the picture of Honolulu. 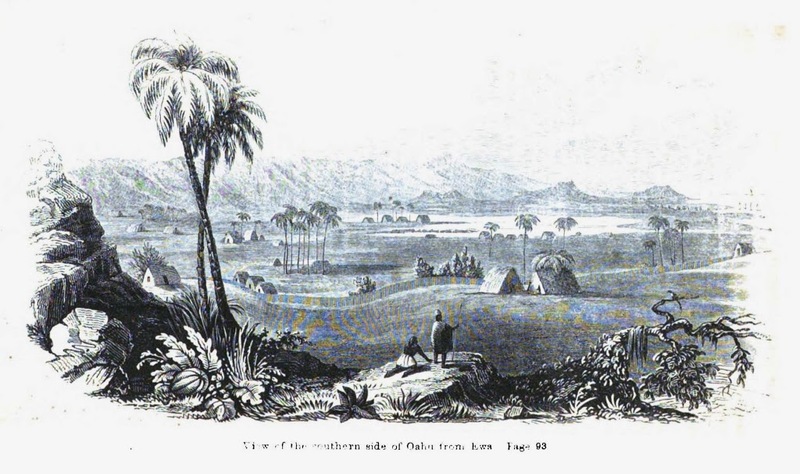 The image shows a view of southern Oʻahu, from ʻEwa (Bingham.) More images are added to a folder of like name in the Photos section on my Facebook and Google+ pages.